CLEVELAND, November 10, 2017 - The Lubrizol Corporation announces today its collaboration with HP as a partner in their Open Materials and Applications Platform to accelerate the development and adoption of its Estane® Engineered Polymers in 3D Printing (3DP) for demanding applications requiring elastomeric properties and strength. 3DP is an exciting technology that has advanced the development of printable thermoplastics materials and their use in rapid prototyping, molds and supports, and small scale final part production. Despite this, innovation is needed to enable full scale industrial production, solidifying the importance of the relationship between Lubrizol and HP. HP's award winning 3D printing technology is overcoming the barriers of speed and cost. The HP Multi Jet Fusion technology enables production of superior quality parts at speeds up to 10 times faster and at half the cost of current systems. Yet achieving full scale manufacturing goals also depends on the range of materials available for 3DP, so designs can be tailored to the specific needs of the application and end use. Conventional manufacturing processes have access to thousands of materials, while today, 3DP is limited to just a few, mostly rigid materials like nylons. With a strong need for specialty elastomeric materials, Lubrizol is well-positioned to develop novel solutions to meet customer needs. Estane® thermoplastic polyurethane (TPU) polymers are long recognized for their outstanding physical, mechanical, haptic and aesthetic properties in industrial and consumer applications including footwear, wearable devices and specialty parts produced by extrusion or molding processes. Today, Estane® TPU polymers are already being applied in FDM (fused deposition modeling) 3DP processes. Gert-Jan Nijhuis, director global strategic marketing - Engineered Materials, states, "3D printing technology is revolutionizing the manufacturing industry and changing the way we design and produce component parts and even finished goods, in parallel allowing customized local manufacturing. We are pleased to announce our partnership with HP and their innovative Multi Jet Fusion technology. Combining HP's differentiating technology with our materials expertise, understanding of end-uses and channels to market will allow us to develop an optimized 3D materials portfolio for the future, maximizing value for our customers." Lubrizol sees 3DP as an enabler to the development and production of even complex parts, but sees additional benefit in faster testing, data generation and modeling that can advance outcomes and benefits well beyond those first imagined. These added capabilities combined with the focus on end-use markets like consumer, sports and recreation, automotive, aerospace, industrial and medical applications, will allow Lubrizol to further their mission to improve lives. 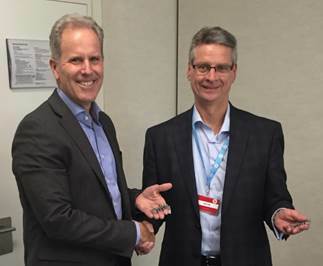 Caption: Stephen Nigro, President of HP 3D Printing, and Rick Tolin, President of Lubrizol Advanced Materials, Inc. shake hands after signing Lubrizol's partnership in HP's Open Platform Materials and Applications Lab to advance the evolution and adoption of 3D printing technologies. In their hands are complex parts produced by HP's Multi Jet Fusion printing process, shown at right. *Bio-based content as certified in accordance with ASTM D-6866 .